CASE 420CT 440CT 450CT Bottom Roller. This listing is for one bottom roller to fit. 180T JCB Compact Track Loader. 190T JCB Compact Track Loader. 420CT Case Compact Track Loader. 440CT Case Compact Track Loader. 445CT Case Compact Track Loader. 450CT Case Compact Track Loader. C175 New Holland Compact Track Loader. C185 New Holland Compact Track Loader. C190 New Holland Compact Track Loader. LT175B New Holland Compact Track Loader. LT185B New Holland Compact Track Loader. LT190B New Holland Compact Track Loader. LT190C New Holland Compact Track Loader. LT195B New Holland Compact Track Loader. TR270 Case Compact Track Loader. TR320 Case Compact Track Loader. TV380 Case Compact Track Loader. C232 New Holland Compact Track Loader. C238 New Holland Compact Track Loader. C227 New Holland Compact Track Loader. 1100T JCB Compact Track Loader. TR340 Case Compact Track Loader. Replacing Worn Undercarriage Parts Can Help You. Prolong The Life of Your Tracks. If you have any questions about what size of track, tire or undercarriage component is right for your machine - please don't hesitate to contact our sales team. Thanks so much for taking the time to visit our listing. CA, WA, IL, TX, GA, and NJ. Deliveries requiring lift-tail gates cost more. If you do not have a forklift, and need lift-gate service, please advise us prior to purchasing. 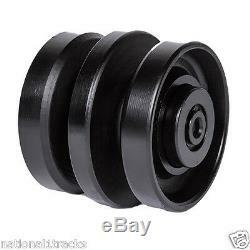 The item "Bottom Roller 87480419 CA925 Fits JCB CASE NEW HOLLAND Track Loaders" is in sale since Wednesday, July 31, 2013. This item is in the category "Business & Industrial\Heavy Equipment, Parts & Attachments\Heavy Equipment Parts & Accessories\Construction Equipment Parts". The seller is "national1tracks" and is located in Calhoun, Georgia. This item can be shipped to United States.